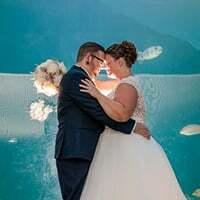 Your next event – wedding, corporate gathering, family reunion, or holiday party – will wow your guests when you hold it at the Museum & Aquarium. Let the unique exhibits, galleries, and outdoor spaces provide an incredible backdrop to the festivities. With ample amenities, an exclusive caterer, and available event enhancements, we’re confident your next event will be as easy to plan as it is unforgettable. The Museum & Aquarium isn't the only unique venue for your next event. For information on hosting an intimate gathering or family picnic at the Mathias Ham Historic Site, email info@rivermuseum.com. Make your wedding a day to remember. Let us help you create the perfect event in a unique setting. The Museum & Aquarium can host your next corporate outing like Company Picnics, Award Ceremonies, Customer Appreciation Events, and Holiday Parties.